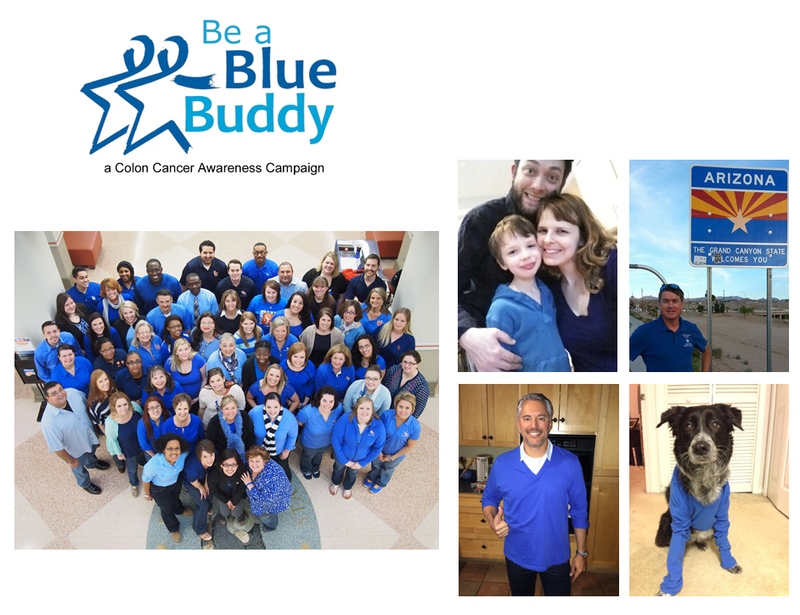 Be a Blue Buddy: a colon cancer awareness campaign. 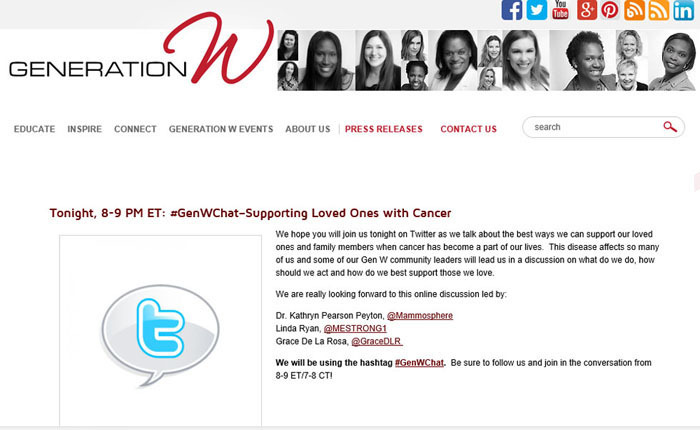 Created by Grace De La Rosa., Stage 3 Colon Cancer Survivor and Advocate. 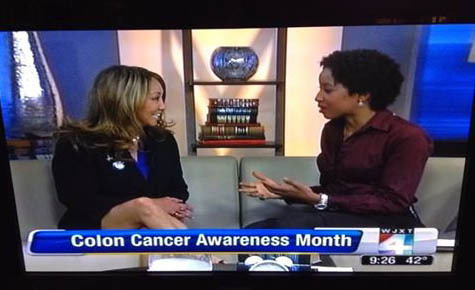 Raising awareness of colon cancer. Giving hope. Saving lives. Mission: To raise awareness and educate the community about colorectal cancer, the importance of screening and early detection; to give hope to newly diagnosed patients; and to save lives. Contact Grace De La Rosa to speak with your organization. Monetary gifts are donated to various colon cancer organizations. In 2014, Grace contributed to Colon Cancer Alliance's (CCA) Blue Note Fund, a national financial assistance program to help patients and their families during their time of need, and to CCA's Blue Hope Prevention Award to assist patients with screening costs. 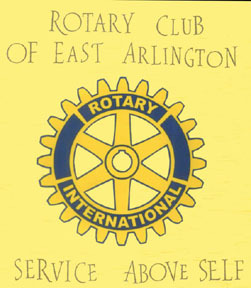 As a member of the East Arlington Rotary, I was privileged to invite Ms. De La Rosa to speak on Colon Cancer Awareness. She presents her subject matter with an understanding that can only be attained through embracing her life as a survivor. Her knowledge of fact and her eloquent explanation of the disease, along with her very personal message, were very motivational. Thank you. Initially I did not plan to attend [the presentation], wrongly assuming that it might be a rehashing of information which I had already read or heard. "Helpful, relevant and interesting all come to mind when describing [Grace's colon cancer awareness presentation] to co-workers and friends. Yesterdays colon cancer awareness Lunch & Learn was one of the best yet. Grace was a wonderful speaker. Her personal story was a real eye opener. It would be great if we could get her back next year before/during colon cancer awareness month. Feb. 20, 2014 - The Beaches Leader article by Jade Douso. Colorectal Cancer Awareness, Jacksonville, FL. 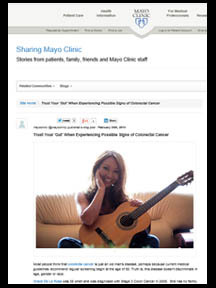 March 4, 2014 - Florida Times-Union article, "One of Us: Grace De La Rosa launches campaign to raise awareness of colorectal cancer," by Charlie Patton. Photo by Will Dickey. March 7, 2014 - WJXT TV4 "Morning Show"
Sept. 18, 2014 - National Colorectal Cancer Round Table (NCCRT) 2014 Blue Star Challenge Runner-Up. 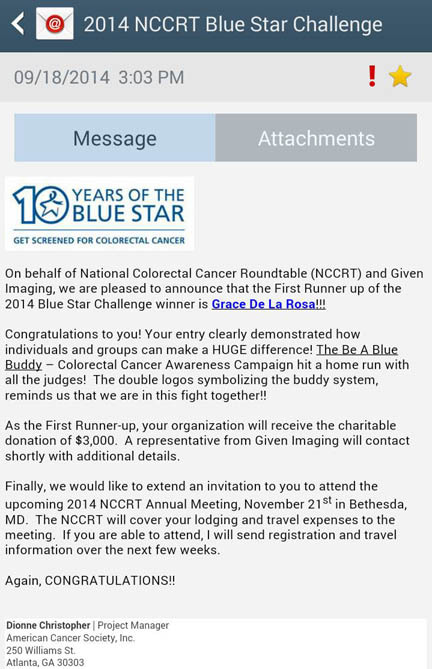 I'm so honored and pleased to win the 2014 National Colorectal Cancer Round Table (NCCRT) Blue Star Challenge! I will be donating all $3,000 of the proceeds to Colon Cancer Alliance (CCA)'s Blue Hope Prevention Award, a financial assistance program for individuals and family members in need of colorectal cancer screenings.My sister shared a wonderful quote with me; a quote that truly tugs at my heart strings and reflects how I feel each and every time I can be of service to the colorectal cancer community, whether it's by corresponding with newly diagnosed patients or their family members through my online cancer journal, social media, or CCA's Buddy volunteer program...or by speaking with groups and organizations to help raise awareness and educate the public about colon cancer, the importance of screening and early detection.The quote below inspires me to continue doing what I thought was a one-time event this past March 2014 (National Colorectal Cancer Awareness Month)--advocating, raising funds for CCA, and spreading the word. Giving hope. Saving lives. Because Screenings Save Lives. I am so proud of my sister Grace De La Rosa's accomplishments! "People who really want to make a difference in the world usually do it, in one way or another. And I've noticed something about people who make a difference in the world: They hold the unshakable conviction that individuals are extremely important, that every life matters. They get excited over one smile. They are willing to feed one stomach, educate one mind, & treat one wound. They aren't determined to revolutionize the world all at once; they're satisfied with small changes. Over time, though, the small changes add up. Sometimes they even transform cities and nations, and yes, the world." 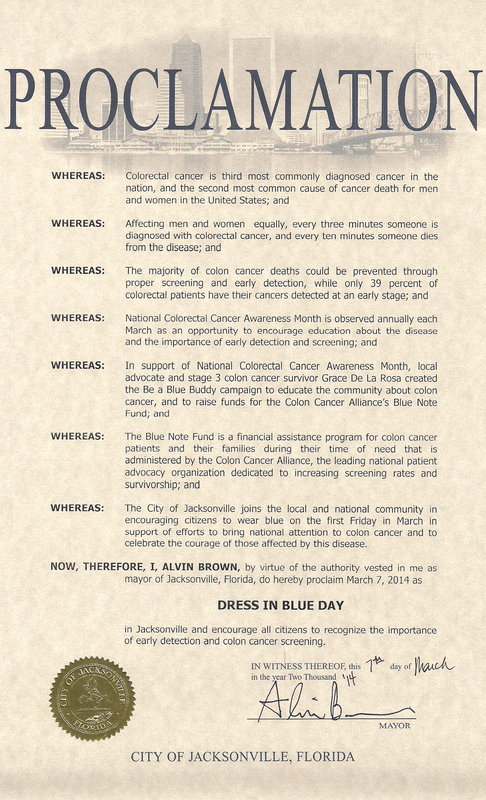 Feb. 11, 2014 - Mayor Alvin Brown grants my request to proclaimDress in Blue Day in Jacksonville, FL on Friday, March 7, 2014 in support of National Colorectal Cancer Awareness Month. View City Proclamation. 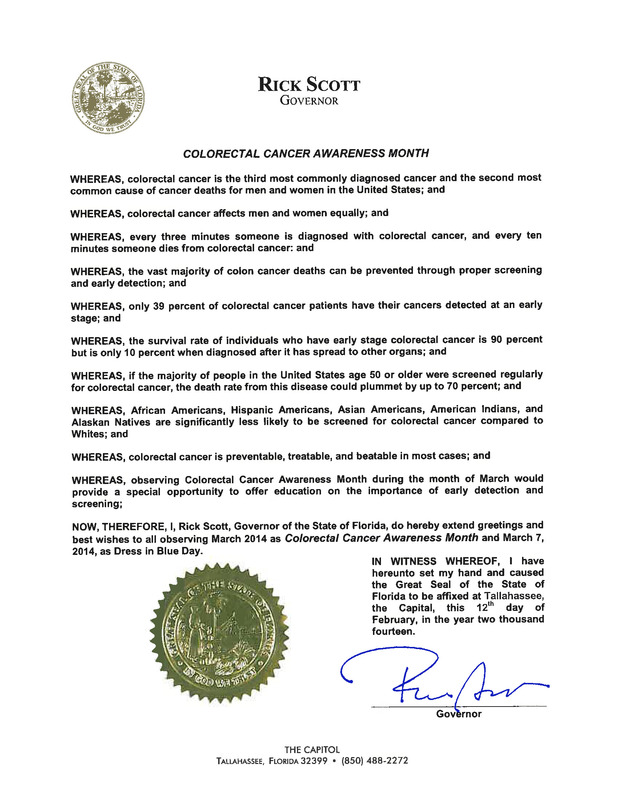 Feb. 12, 2014 - Governor Rick Scott grants my request to proclaim March 2014 as National Colorectal Cancer Awareness Month and Dress in Blue Day on Fri., March 7, 2014 in the State of FL. View State Proclamation. 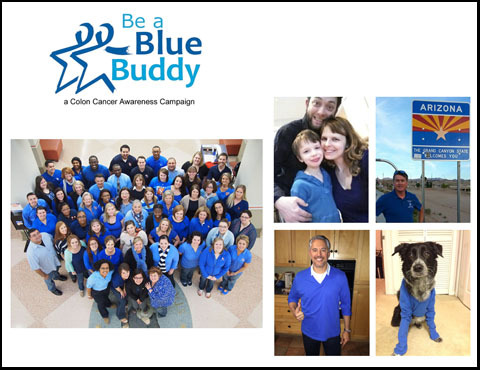 The Be a Blue Buddy fundraising site is NOW LIVE through March 31, 2014! Raising funds to donate to Colon Cancer Alliance's Blue Note Fund, a financial assistance program to help colorectal cancer patients and their families in their time of need. I understand that not everybody can contribute financially, but you can still help. Please click on the link below and SHARE the page with your family, friends and colleagues. WEAR BLUE! National Dress in Blue Day is on the first Friday in March. Send photos of you and your group dressed in blue. I'd love to post them on my website and Facebook page!